One of our best selling items here at Calendar Lady Promotions is our Coloured Thermo-mugs. They come in various colours. Printing available to carry your companies details and logo, so you can be advertising yourself while your drinking your tea. 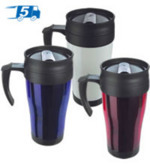 So advertise your details on one of our Coloured Thermo-Mugs today! Please call for FREE quote! To find out more about our Coloured Thermo-Mugs click here and fill in the contact form and we'll get straight back to you. Lots more here and different products to the Coloured Thermo-Mugs click here. More images and details of the Promotional Thermo-Mug available here, a great corporate gift, ideal for the workers outside.